I have long, think, wavy hair that seemingly goes out of its way to become knotted. It sometimes feels that all I have to do is look the wrong way at my hair and hello mini dread lock. I like to think that I have de-tangling down to a fine art and although I do like the Wet Brush it is my little line up of Tangle Teezers which see the most action. I guess deep down I can't quite wrap my head around brushing wet hair? Speaking of wet hair my go to duo is Uniqu One All in One Hair Treatment in Coconut (it smells like pina colada cocktails but you can get it in a more traditional floral hair scent too) and the Tangle Teezer Splash. If I am not wrong the Tangle Teezer Splash was created for those who swim and generally water use but I find it to be the easiest to grip especially with wet hands as it has a non-slip coating. Unlike the original Tangle Teezer this has a hollow back so water does not get trapped and become stale over time - I actually keep mine in the shower and use it to comb through conditioner on occasion. 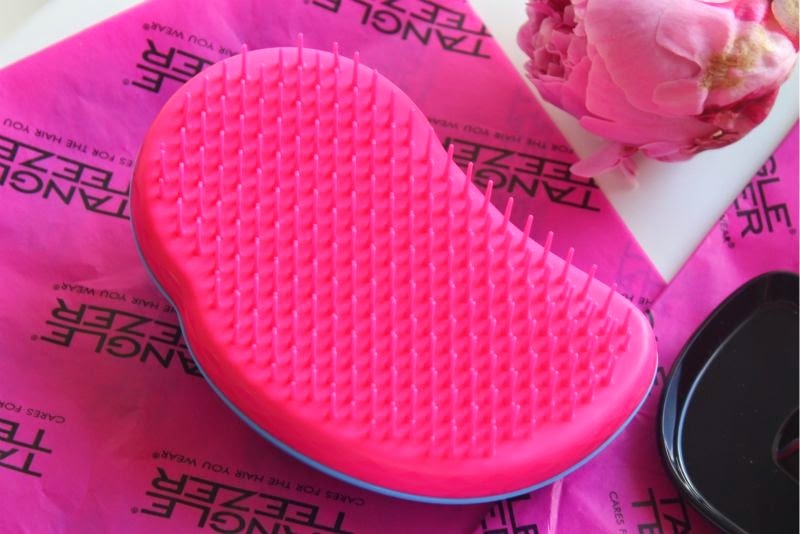 The Tangle Teezer Splash may look slightly daunting but it has been designed to de-tangle as well as smooth the hair's cuticle which helps prevent the hair from becoming damaged. If I could recommend one Tangle Teezer it would be this, I've lost count to just how many people I have turned this on to. My notoriously fickle sister even swears by hers and this is a girl who has openly stated she'd rather shave her head than work knots out of her hair. I kid you not. 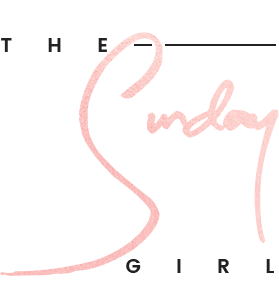 Before the Tangle Teezer Splash came along the original Tangle Teezer was all us beauty and hair types could gush about. How could one little brightly coloured brush revolutionise hair care? To this day I still can't answer that question but all I know is that nothing removes knots and tangles quite like it all the while being gentle, pain free and of course kind to the hair.I find myself looking at typical hair brushes and brushes as torture devices these days and dread going to the hairdressers for that very reason. 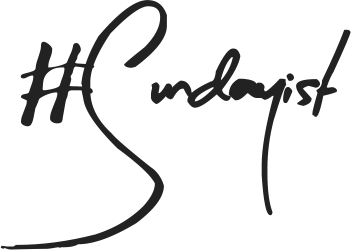 I see the original Tangle Teezer as your go to everyday brush (it can't be used with heat), the Tangle Teezer Splash more as a comb for gently removing knots et al with the help of a leave in conditioner. For those who like to travel light or simply want a smaller brush to cart around daily there is of course the Tangle Teezer compact, which annoyingly is a little more pricey than the full size brush - no idea at all why that is. The main difference size aside is that the compact version comes with a clip on cover to protect it while on your travels. I find that said cover prevents the bristles from becoming bent (perfume bottles are the devil reincarnated for this) as well as stopping general fluff etc from gathering within the brushes teeth. I actually prefer the size of the smaller Tangle Teezer as my stubbly little hands find it easier to grip. 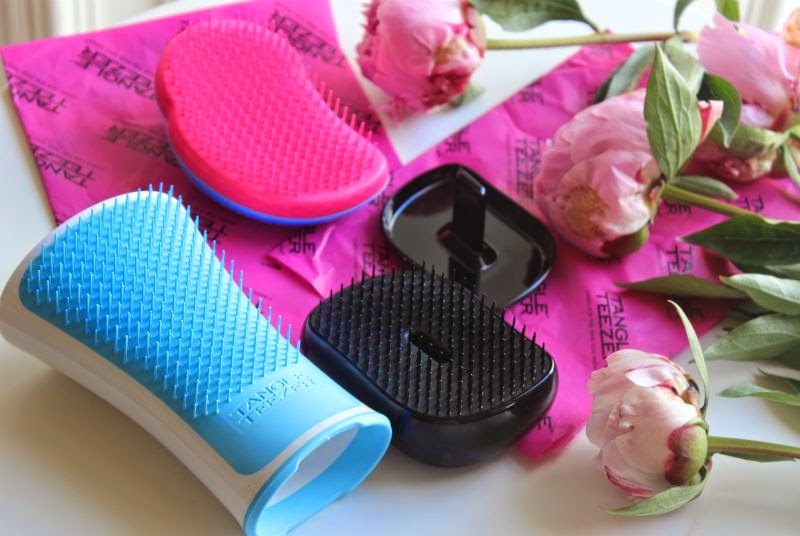 Basically whatever your needs there is a Tangle Teezer for you. You can find the entire range of Tangle Teezers via ASOS with prices starting at £10-£13 - link.